The Chart of Knowledge is from The Vehicle of Light, by Murshid F. A. Ali ElSenossi. 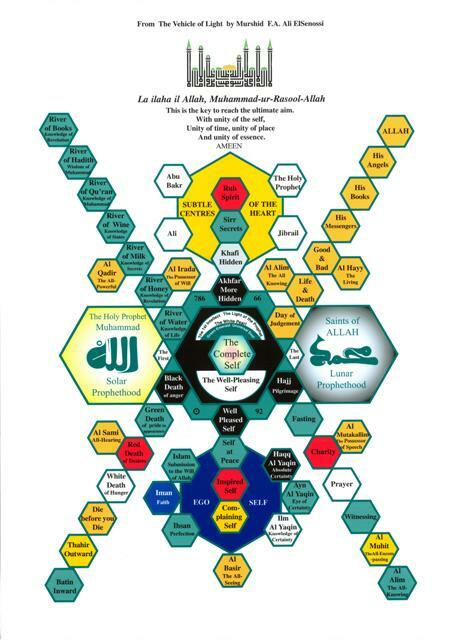 This diagram, part of the Burhaniyya Path of Knowledge, is a means of meditation, contemplation and most importantly, visualisation. The name which is written upon each door is the key to open and unlock the knowledge contained within it. Each door describes a different state of consciousness and knowledge which is completely separate - and yet fully connected to the others. Whatever point you start from - the destination is the centre. The green thread which connects everything to everything is like the Breath of the Merciful (An Nafas ar Rahman). To achieve maximum results from the visualisation of this diagram, it is suggested that each name be written separately on a piece of paper in order to research and study all knowledge that is related to that point of entry. Most importantly is the visualisation of that door, the name upon it and everything that is connected to it. May our Beloved Allah (Subhana wa Taala) grant us all success.